Below are some questions that members of the mathematical community at IISER find interesting and/or challenging. The “Hawaiian Earring” is the union of circles that pass through the origin and have centres on a ray at distances of 1∕n from the origin as n ranges over the natural numbers. Is there Torsion in the fundamental group of the Hawaiian earring? Galois Theory associates a finite group to every polynomial equation. Noether’s inverse Galois problem asks whether, given a finite group G, one can find a polynomial whose Galois group is G. It is already interesting to find such a polynomial for the alternating group An. 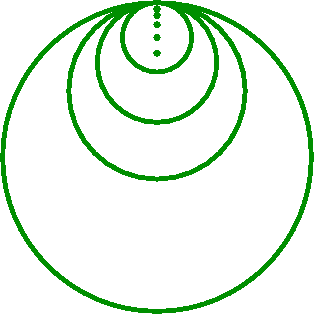 The homotopy groups of spheres are finitely generated abelian groups. In fact, they are often finite. Given natural numbers n and m with n > m > 1, one would like to compute properties of the group πn(Sm) like its size and the fundamental divisors. Abel showed that a general equation of degree 5 over rationals cannot be solved using radicals (n-th roots). Can “good” approximate solutions be found using radicals? Here “good”-ness is measured not only in terms of usual distance but also in number-theoretic terms by p-adic norms. What can we say about the finite subgroups of the group of square matrices of size n with integer coefficients and determinant 1? If G is a non-Abelian group and g is any element, then an inner automorphism ιG,g of G is defined by h ghg-1. Clearly, if G′ is a group that contains G, then ιG′,g restricts to ιG,g on G′. In other words, the automorphism iG,g extends to every larger group G′. Is the converse true? Given that an automorphism τ of G extends to every group G′ that contains G, is it true that τ = ιG,g for some g in G.
The only group without automorphisms is ℤ∕2ℤ. What kinds of groups have larger automorphism groups than themselves (“Abundant Groups”) and smaller automorphism groups than themselves (“Deficient Groups”). Is it true that one of these is parallelisable? Iterated tangent bundle is parallelisable.